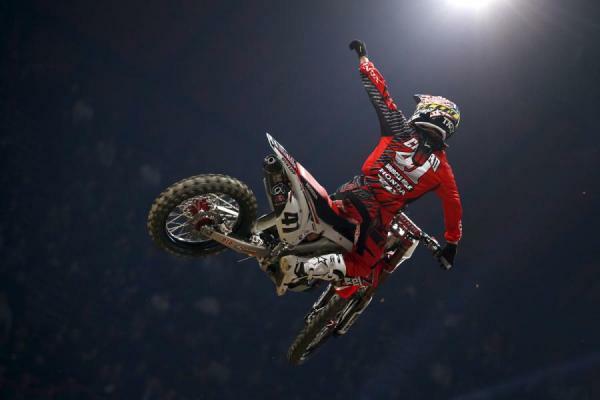 The 31st annual Bercy Supercross took place tonight and the main event saw French hero Gauthier Paulin grab the holeshot from the inside gate pick and lead for a lap or so. Then Honda Muscle Milk’s Justin Barcia decided that enough was enough, grabbed the lead in the tunnels and took off for an uncontested win. Barcia, an ex-King of Bercy, certainly looked great all day long and although he was getting caught at one point by his teammate Trey Canard, he was able to pull out a good gap thanks from some mistakes from Canard and take a pretty easy win. “I lost an elimination race and it was close, almost got him [Paulin] at the end” said Barcia after the race. “I’ve been here three times now and it’s the best track. It’s tight inside, big whoops, outside is fast and the dirt is good but should get harder. The gate pick has to be number one or two, that’s key. I don’t want number two but I’d take it. 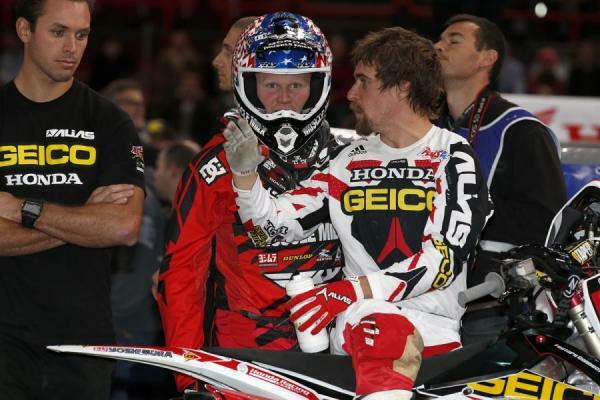 Trey Canard challenged Barcia, but would have to settle for second. Ah yes, the Joker Lane. Incorporating a Joker Lane onto the track to be used one time in the main event did indeed come into play in tonight’s main event when BTOSports KTM’s Andrew Short forgot to take it. Yes, we’re serious. It resulted in a ten second penalty for Short and knocked him back from fourth to fifth. GEICO Honda’s Wil Hahn benefitted from the mistake and moved up one position. “I saw Short not take the Joker Lane and I celebrated. I might have even done a nac-nac in the tunnels on the last lap. I’ll take the fourth!” said an excited Hahn after the race. Hahn was lucky to even be lining up for the main after a scary crash in the elimination races where he collided with Red Bull KTM’s Jordi Tixier and landed off the track, front-flipped onto an air barrier and then bounced off that and right onto some sand before the whoops in the next lane. Thankfully Hahn bounced right up but he was out of the elimination races and had a poor gate pick for the main event. 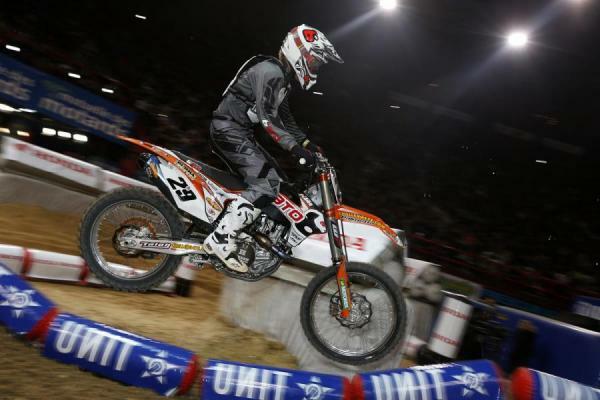 French star Gautier Paulin would finish third in front of the home crowd. Andrew Short finished fifth after missing Joker Lane and being docked ten seconds. Paulin ended up third in the main event a ways ahead of Short (pre-penalty) and even more a ways back of Canard who stalked Barcia early on but made that mistake in the turn. “I’d like a better result but it’s great. This is a really good thing for me in terms of intensity and gate drops. There are a lot of things I can work on, including my first laps and charging hard,” said Canard after the race. “I had a good race but lost about three seconds in the turn after the finish. Barcia kicked a rock up and I almost lost my front end and had to roll the next bit. I did feel like I was making up ground and it wasn’t enough. 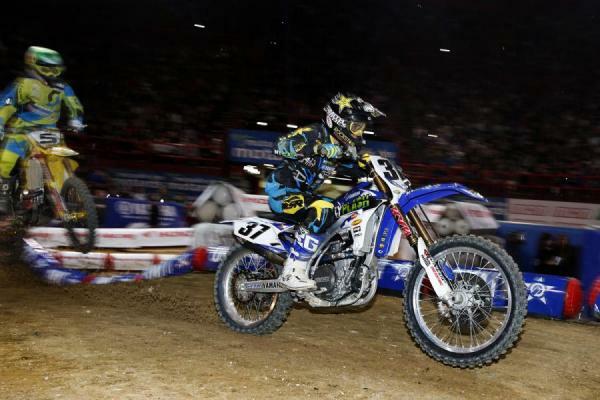 MyPlash/Star Racing Yamaha’s Cooper Webb, in his first Bercy appearance, crashed on the first lap and was way back. He battled hard but finished a ways back. 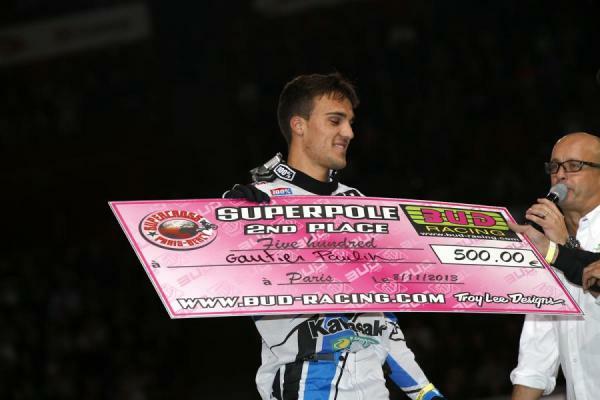 The Super-Pole was won by Barcia as he squeaked it out over Paulin and was given 1000 Euros for his trouble. Wil Hahn would take fourth after Short was docked ten seconds. Cooper Webb had a crash in his Bercy debut and finished 11th. As we made mention the elimination races were very key as the start favors the inside gates, and gate pick is based on the elimination races. So riders really had to buckle down and try their hardest to make through the three two-lap sprints. Paulin managed to win the second race in a great ride that made the fans happy as he was shadowed by Barcia and Canard. The final saw Barcia versus Paulin and Justin grabbed the start and was never challenged again. Remember folks, Bercy is three nights and this is just the first one. Stay tuned right here for nights two and three!